In the past decade, the people of North Korea have changed, but the nature of the regime certainly hasn’t. To most people, North Korea is a mystery. Nuclear weapons, seemingly mad dictators with crazy hairstyles, soldiers marching lock-step, and brainwashed citizens applauding in an automated way — these are the popular images. A new report released today – Movies, Markets and Mass Surveillance: Human Rights in North Korea After a Decade of Change – suggests that the situation in what has become known as the Hermit Kingdom is more complex than that. President Donald Trump’s decision to invite an extraordinary North Korean escapee to his 2018 State of the Union address and to meet with North Koreans privately is very welcome. If the United States puts human rights in North Korea at the top of its agenda, it could make a significant difference. The West should have been doing this already, but better late than never. Failure to do so has allowed fellow travelers to imply amoral equivalence between the United States and North Korea as they have played poker with nuclear weapons. How quickly we forget what helped to pull away the bottom layer of bricks in the Soviet edifice. Just over ten years ago, the human rights organization Christian Solidarity Worldwide (CSW) published a ground-breaking report, North Korea: A Case to Answer, A Call to Act. One of the first human rights reports to conclude that the North Korean regime is committing crimes against humanity, it was also one of the first to call on the United Nations to establish a Commission of Inquiry to investigate. For several years, many people ridiculed us. They said the UN would never do this. They said we were banging our heads against a brick wall. We said if enough of us bang our heads for long enough, we might dislodge some bricks. Four years later, a growing number of other human rights organizations had joined the call, and 40 of us came together from around the world to form the International Coalition to Stop Crimes Against Humanity in North Korea, to call for a UN inquiry. A little over a year later the UN High Commissioner for Human Rights lent her voice to this call, and the UN Human Rights Council established the very inquiry that the nay-sayers said could never happen. Our first report is now ten years old. The UN inquiry’s report is four years old this month, and I have spent much of the past four years trying to get the world to respond. So our new report released today is an attempt to bring us up to date. After surveying more than 100 respondents, including recent North Korean escapees, UN officials, and human rights experts, our conclusion is this: in the past decade, the people of North Korea have changed, while the regime in its nature certainly hasn’t. There are three ways in which North Korea has changed over the past decade: the economy, human rights, and the flow of information. And these three are interconnected. 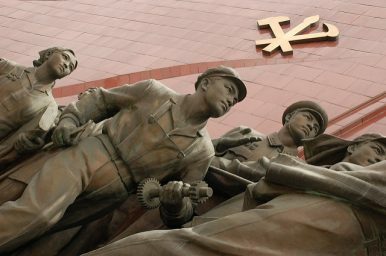 In the economy, the most striking change in the lives of many North Koreans has been the shift from dependence on the state-run public distribution system to widespread reliance on private trading, in what has become a grey area of semi-tolerated markets. Illegal market trading, including smuggling across the border with China, has provided North Koreans with a lifeline – and a source of relative prosperity for a few. It has also led to an increasingly visible gap between rich and poor. And what this has meant is that dissent is growing. People complain about having to pay bribes to get medical care, education or a job – and poverty, malnutrition, and related diseases are still widespread. According to Care International, 18 million people – 70 percent of the population – are in urgent need of food. Third, there have been changes in human rights. It is absolutely vital that this is not overstated or misunderstood. The starting point is that the human rights crisis in North Korea is widely recognized as among the very worst in the world. A previous UN special rapporteur described it as “sui generis” – in a category of its own. In North Korea, every single article of the Universal Declaration of Human Rights is violated in extremity. However, some anecdotal evidence suggests that international pressure may have made some difference, however small. In 2009, the term “human rights” was included in North Korea’s constitution for the first time. A few recent escapees claim that when they were in prison they escaped beatings and torture, or endured less severe abuses, because prison guards told them an international inquiry was watching. “There has been some improvement,” said one escapee. “I heard about the UN noise and fuss. Without this, no one would know about human rights at all.” These are no more than tiny flickers of hope – but even such tiny flickers in otherwise total darkness might provide something to build on. What does this mean for international policy? It means first we should go on making “noise and fuss” about North Korea’s crimes against humanity, because doing so makes a difference and is long overdue. It means we must increase the flow of information into North Korea. And it means that we should increase engagement with the growing community of North Korean exiles, whom we can empower, equip, learn from and work with to develop a better future for the Korean Peninsula. We must learn from the changes in the country, and work together with the people – inside and in exile – to change this barbaric regime. Benedict Rogers is East Asia Team Leader at the human rights organization Christian Solidarity Worldwide, and co-founder of the International Coalition to Stop Crimes Against Humanity in North Korea. "The North Korean regime is not simply a pariah to be ridiculed, but a dangerous threat to the world."